The GRAMOPHONE Pre Amplifier 33.3 V2 Limited Edition, hereafter referred to merely as HB 33.3, is another British maverick solution, of impeccable pedigree, to that most difficult of tasks, the amplification and equalisation of puny pick-up cartridge voltages to line level while simultaneously cranking the signal through a compound curve EQ roughly equating to a 6dB per octave bass-boost-treble-cut. This task is SO MUCH MORE DIFFICULT than any other in analogue audio. It is the equivalent of amplifying a microphone signal while the bass is turned full up +10 (+11 on Spinal Tap's PA) and the treble -10. "How can we avoid being deafened by 50Hz?" scream plebs, stage left. Precisely the challenge (although YMMV = your mains may vary to 60Hz in some places), replieth ye olde scribe. So the power supply (psu) has to be mint. Clean. Pure. Given that aforementioned EQ, ripple has to be at least 21dB better than the Radiotron Designers Handbook recommends for microphones, in order to have equal mains hum rejection for a magnetic cartridge. The 33.3 PSU is sited outboard to exclude any intrusion of stray AC (alternating current) hum within the main 33.3 chassis. 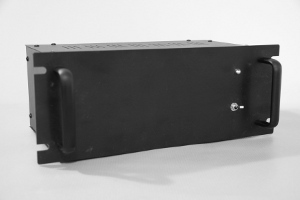 The psu features a double Pi filter for smoothing, so called because it is like two Pi filters with a shared leg. Pi filters are so called because when drawn their series and parallel components resemble the Greek letter pi, Π. The 33.3's Wigan origins do not explain why Haden uses more pies, although Wigan is home to the annual World Pie Eating Championship. No pies were harmed in the making of this power supply. The result is a very quiet, all valve (yes they are "tube" types, being ECC83/12AX7, a medium mu, high gain B9a 'miniature' compared to bulbous GT equivalents) double triode, so called because there are two identical valves in each glass envelope. This has probably been the most popular UK choice for phono pre-amps since the great valve revival of the 1980s. Coincidentally the ECC83 has a gain of around 100x, which is what the whole Gram 33.3 achieves net of the feedback in its active RIAA stage. Around 2 million ECC83/12AX7 are still produced every year (mostly in China or the former Soviet Union countries) so spares will never be a problem and tube rolling only costs pairs. The Gramophone 33.3 designer and builder Haden Boardman should need no introduction to the world's Garrard 301/401 afficionados. As one of the principle UK voices most responsible for the revival of this turntable, Haden has much for which to be thanked. Indeed, in Europe the 401/301 family has come close to the cult status they already enjoyed in parts of Asia, after decades of dismissal by the subchassis worshipping European Audiophile Turntable Hegemony. On this side of the pond, anything with less than 3 springs between platter/arm and planet surface was burned at the stake with its owner during the 80s and early 90s. The AR may have started the trend, but bouncy Thorens, Transcriptors, Leak, Ariston, Michell, Linn, Fons, The Source, Systemdeck, Pink Triangle, ad infinitum (they're still coming) hammered nails in the coffin of the old idler drive decks like the Garrards, 124s and Lencos. Your old scribe used to act as schoolboy hifi valuer for a thrift store (in exchange for 1st dibs at cost, for example, enabling the acquisition of a Transcriptor Saturn for less than 20€) and once advised them in about '75 to remove a SME 3009 from a 401, sell the SME and virtually give the 401 away with its plinth. The '70s HiFi Yearbooks featured pages of Black Night Rumblecure accessories for 301/401, which would would be enough deter anyone from buying a turntable that looked like it needed improvement from hectares of carpet underlay. The situation deteriorated for Idler drive turntables in the Scottish Turntable worshipping days, such that Thorens 124's, Lencos and Garrards would be left over at the end of charity sales. Then along came dissidents like Haden Boardman. The HB 33-3 phono stage is designed and built in Lancashire (immediately prejudicing Heather, who being from t'other side o't'Pennines hasn't forgotten the Wars of The Roses) in the heart of England's industrial North, where the whole business of industrial invention and production was perfected 200 years ago. The HB 33-3 is hand built in small batches, thus reversing this trend. 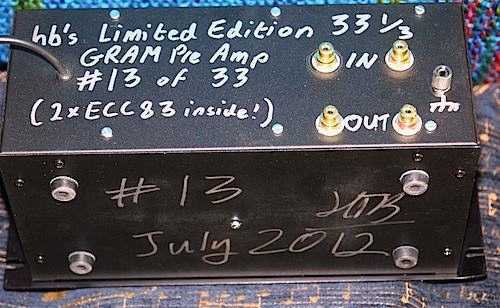 The test sample is number 13 of 33 samples of this limited edition version of the HB GRAMOPHONE Pre Amplifier 33.3 V2. Haden emphasises the importance of Phase, Timbre and Timing in the design priorities for this baby. His abbreviation PTT, more reminiscent of the French postal service, covers the RaT in PRaT but replaces outright Pace with Timbre, in the design equation. The musical term 'timbre' encompass tonal accuracy (frequency response), timing within an instrument's envelope, and dynamic accuracy. Research demonstrates that removing the first and final few milliseconds of an individual note from various musical instruments makes it impossible for test subjects to discriminate between instruments. Hence accurate timbre must be maintained from the teeny tiny cartridge mV output, if the music from the speakers is to make any sense at all. The HB 33.3 addresses tonal accuracy by remaining true to the original RIAA curve to within 0.5% and balances channels as accurately as can be measured in production. There are many well rehearsed arguments about variations on the RIAA curve to allow for cutter resonance/roll-off, lunar phases, cutting engineer hearing loss (70's pressings), label policies, so the default, de facto standard is going to allow your old scribe to get on with the review without further tangents. "What about Allen Wright's RIAA EQ work?" challenge plebs, stage left. "No", replieth the old scribe, "Choices have to be made at some point. Subject closed". Which brings us neatly, dear reader, to the other decisions that must be made about implementing phono stage design. GAIN: this has a lot of gain, so much so that I ran medium output moving coil cartridges straight in and they worked fine. This does not mean all MC cartridges will work, as many have puny outputs or need much lower input impedance (like 100Ω) than the 68kΩ on the HB 33.3. offer here. Not mentioned on the website is the decision to use 68kΩ input impedance. Moving Magnet cartridges can be sensitive to input resistance and capacitance. That is why many manufacturers offer very precise recommendations for Recommended capacitance (often mostly pick up arm cable capacitance) to produce a flattish frequency response in conjunction with the usual 47kΩ input resistance. Some old Shures (especially the M95 series) could not produce a flat frequency response without lower resistance and higher capacitance. To meet this demand, many high-spec receivers and pre-amps had switchable input options or interchangeable input boards, still available in some cases like the Canor TP306 VR+. Moving iron cartridges do seem particularly sensitive to load, so this might need specifying when ordering. The modified Decca did exhibit a nasty peak and some ringing above 10kHz, but this also confirmed that the HB 33.3 recovers exceptionally well from clicks, pops and sibilants. The ability of a cartridge/phono-stage combo to recover from momentary non-musical signals is one of the defining characteristics of successful vinyl front ends. It is ricochet overshoot following clicks that puts many off vinyl replay and the HB 33.3 passes this basic parameter much better than many more than 3 or 4 times the price of the HB 33.3. Another decision that has to be made by a manufacturer is casework. The stove enamelled black 3U rack with 2mm aluminium front panel, drilled for rack mounting, can only be described as utilitarian looking. The Plebs Chorus know my views on encasing circuits, especially pre-amplifiers, in steel coffins and this decision must have been made with regard to producing a model at £450 retail - no mean feat. I do know that, even far Eastern, OEM more-aluminium-than-steel standard boxes cost more than the retail price of this completed product, so an all wood and copper Japanese super amp case is out of the question. Haden's solution, which is not unique in the world of audiophilia, but probably unique at this price point, is adherence to the golden ratio. The case dimensions conform to 1 = 1:1.61803. Haden argues that, "It is not just material, material thickness & density, but the shape as well that has a major effect on the sound". Haden reduces case mass to the minimum to minimise stored energy. Within that minimal case layout compromises are balanced carefully. The pcb is far enough from the back panel to minimise hysteris effects of the steel panel, while near enough to minimise unscreened hook up wire lengths. During audition your old scribe tried various combinations of removed casework and the miniscule effects were testament to effective case design, although lid off was sufficient improvement to run the remainder of audition with the lid off. This case spec is an example of clever design mitigating a potential problem at much less unit cost than typical couture solutions. The pcb flies in the face of purist point-to-point obsessions. 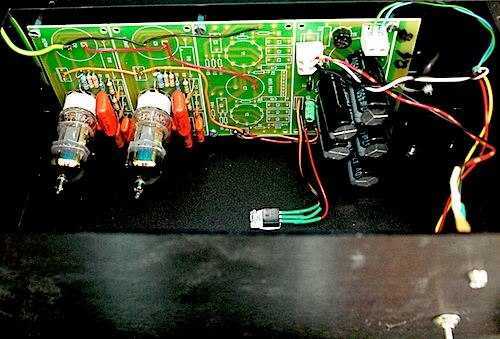 It is close enough to the back to keep the wiring short, and more importantly, the power supply (PSU) is outboard. This keeps noise down (subjectively it is as low as most solid state MM phono stages) and might also allow room for future PSU upgrades if research suggests such to be worthwhile. Haden Boardman's GRAMOPHONE Pre Amplifier 33.3 V2 Limited Edition phono stage immediately impresses with its liveliness, as it raises the output of the modified Decca, despite the obvious impedance mismatch between this sub 30kΩ loving moving iron legend and the 68kΩ input of the HB 33.3. The rising treble could not be cured by tweeter toe-in as the evenly dispersing B&C DE-400TN-8 with 90° horns are currently in system. The NS10 paper tissue trick is all wrong on an audiophile page, so pulling tweeter level down with a simple voltage divider had to suffice. This had the perfect synergy of dropping the level above 8kHz, precisely the point at which the uptilt had been audible. The Decca (now London) is a fast-as-f*ck transducer and the HB 33.3 kept up, reminiscent of Doug Dunlop's Excelsior fed by his London Super Gold. uncannily similar in character in fact, but the HB 33.3 displays its modern origins by reduced grain and increased transparency. Familiar records with hi-hat snap and rim shots were handled with speed and grace. Bass is understandably thin with this loading on the Decca but bass articulation points to greater things with better matched cartridges. Timing is better than anything red book digital can manage, even if short of those passive EQ phono stages costing over £2000. The first dozen or so discs on the list below were played by the Decca through the HB 33.3 without any urgent desire to change carts, so the mismatch was not getting in the way of the music. Surface noise is reduced compared with the Decca feeding some phono stages, but the bite of Trevor Pinnock's original instruments ensemble performing selections from Handel, conducted from the harpsichord continuo, have the snap that only Deccas can achieve. Installing the Cartridge Man MusicMaker in the Hadcock 242SE Silver shifts the experience up a gear. With the tweeters returned to their 'flat' alignment, the sound balance achieved accurate frequency response at last. Haden does not subscribe to the Allen Wright 50kHz uplift to compensate for lathe roll off, but unless your cartridge-vinyl tip resonance is of the CD4/UD4 variety, there'll be nothing to amplify up there anyway. With the MusicMaker in the driving seat, the bass is solid, the soundstage is solid, and the treble is fluid. Not high-end moving coil into £5k phonostage fluidity, but the sum of these parts is way above their collective cost. The Rolling Stones' rhythms drive along, Wyman's bass clear below the wall of guitars and vocals. Little Feat's turntable torture track, Long Distance Love, articulates heavy bass below clear vocal harmonies. Stevie Wonder's deft keyboards and immaculate production are clear to hear. The good rhythm performance is probably thanks to the power supply as the outboard mains transformer (mtx) is over sized and all power supply components "are about 10x the rating they need to be". Experiments by the flat earth brigade have always supported the bigger mtx equals better rhythm. Even though it lacks the high-end finesse of more costly set ups, this is a combination I could live with: Michell Orbe SE turntable mounted on modified Origin Live Ultra wall shelf, Hadcock 242SE Silver pickup arm, Cartridge Man MusicMaker cartridge, Haden Boardman's HB GRAMOPHONE Pre Amplifier 33.3 V2 Limited Edition. The dynamics are as good as it gets from a vinyl front end up to two or three times the price. Perhaps a rebuilt Garrard 401 and a £5k strain gauge cartridge might take things further. subtlety and the finest nuances are not on a par with high end MC's feeding £2500 phono stages like the Canor TP106 VR+, but the macro-dynamics combined with the PRaT make this a satisfactory phono-stage that enables enough musical information to be retrieved. The soundstage from the MusicMaker through the HB 33.3 is wide at the front and deep at the centre. It extends beyond the loudspeakers and back through the back wall. The Canor TP106 VR+ manages more width at the back and even more delusion of height at times. However, pinpoint imagery does not exist in audio unless faked, and neither of these capable phono stages attempt such affectation. So dynamic and so capable of macro dynamics and soundstage is the HB33.3 that your old scribe succumbed to the audiophile cliché, Reference Recordings RR12, Däfos;. The MusicMaker/HB 33.3 combo performed with aplomb. The dynamics equalled anything from any front end, exceeding the Source/Odyssey/Decca Supergold/Excelsior and Linn/Naim -5/Hicap benchmarks contemporary with its release. Ambience and microdynamics may not be up with the latest high end but both bombast and soundstage are enormous. Really, really big. Just to check its tiny signal handling, a low output MC was connected, one that's happy with 68kΩ but needs at least 30-50dB more gain. It worked. The noise was not too intrusive and everything was there. "What a stupid thing to do", heckle plebs chorus, stage left, "This tells us nothing useful, who in their right mind hooks up low output MC's to MM inputs"
It demonstrates downward dynamic range, to coin another phrase from the aforementioned Allen Wright. This phono stage can handle the tiniest of signals, so little is lost this early in the amplification chain. Your old scribe had just decided this front end is good enough for all but the most critical high-enders, not knowing how much more than the £444 website price it was, and then came a surprise. With a price of "£451 with free delivery anywhere on the Planet" this is right on the money. Like Glenn Croft's designs, finish is Caterham while sound is Aston Martin. Haden offers a "30 day money back guarantee if not 100% happy with the unit's performance" so it is a risk free, unseen, unheard mail order purchase. If buyers are expecting Acoustic Research Reference series performance for this money, they will be disappointed. However, it will beat any used AR or CJ available at twice the price. To achieve this transparency and accuracy from an all passive, zero feedback, design requires at least 3 gain stages and MUCH BIGGER passive components that therefore have to be of commensurate higher quality to counteract their higher values: we'd be talking Black Gates, Hovlands; AN silver and their ilk. That is why good zero feedback phono stages tend to cost so much or soon get butchered by owners installing their favourite flava caps. "How dramatic?" enquire plebs, stage left. Your old scribe misunderstood communications and descriptions and believed he was reviewing a Special [limited] Edition of the basic HB 33.3, and that the basic HB 33.3 cost £444 and therefore the Special Edition probably cost about double that. The Haden Boardman GRAMOPHONE Pre Amplifier 33.3 V2 Limited Edition was marked on that basis and compared on that value scale. On that value scale this phono amplifier succeeded in being competitive, even a bargain, blowing into the weeds another similarly priced well known British phono pre-amp that appears in the comics' lists of Recommended devices per price point. On discovering that this phono pre-amp costs just £450 direct from the maker, this puts it against pre-amplifiers like the YAQIN MS-12B. There is just no comparison. This British designed and made unit is playing a couple of leagues above the YAQIN. The latter looks fancier, but needs a complete set of circuit mods and upgrades to get into audiophile territory. The Haden Boardman GRAMOPHONE Pre Amplifier 33.3 V2 Limited Edition phono stage is there from kick off. Georg Handel: Orkestrawerke, splendid 1985 boxed set by The English Concert on authentic instruments, directed by Trevor Pinnock with the joie de vivre possible in orchestral music still based in dance forms.